In a previous article I expressed my profound dislike for Republicans. One of the reasons why I hate them is because they call themselves conservatives, and I don’t see many things we need to conserve in this Amerika we have today. As Thomas Paine observed in his introduction to Common Sense, “A long habit of not thinking a thing wrong, gives it a superficial appearance of being right, and raises at first a formidable outcry in defense of custom.” This applies to a “t” to current conservative Republicans’ thinking. A question I have asked myself many times is what do the so-called conservatives want to conserve? Do they want to conserve the corrupt two-party system? Do they want to keep the globalists using the U.S. armed forces to impose the CFR conspirators’ New Gay World Order upon the peoples of the world? Why do conservatives want to preserve the Patriot Act, the TSA, the NASA and other government laws and agencies solely created to curtail and eventually destroy our freedoms? Why do they love so much and want to perpetuate the current militarization of police? Heraclitus’ philosophy focuses on change. According to him, “Everything changes and nothing stands still.” In contrast, it seems that the conservative Republicans’ view of the world is focused on immutability. To them, nothing evolves, nothing changes. Everything remains the same, forever and ever. Unfortunately, however, they are dead wrong, because during the past half century America has changed dramatically, and not for the better. In his 2003 book, Judge Robert Bork called America A Country I Do Not Recognize. He was right. Present America has nothing to do with the exceptional country based on some pillars — common law, free-market capitalism and Judeo-Christian values and ethics — it once was. Nevertheless, conservative Republicans live in an immutable world where nothing changes and everything remains the same. Unfortunately, however, this world exists only in their imagination. There are some Republican mantras that prove my point: their support for the police, their love for the military, their respect for the government and its laws, their concern for national security, their hatred of Communism. But, as I will show below, those things have changed so much in the past half century that today they are quite different from the images conservative Republicans have in their minds. 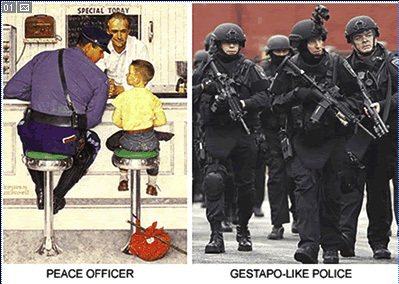 For example, the image of the police most conservative Republicans seem to have in their minds is the one depicted by painter Norman Rockwell: a policeman as peace officer. As the name implied, the main goal of peace officers was to maintain peace among citizens. But currently policemen are not peace officers anymore. They are now called “law enforcement” officers. Their main duty if not serving and protecting the citizens but enforcing the laws — many of which are arbitrary, unconstitutional and outright illegal. The current scandal around the Albuquerque Police Department and its frequent use of deadly force upon unarmed citizens has called the public’s attention on the problem, but Albuquerque is not an isolated case. All around the U.S. police officers are assaulting and killing American citizens. Unfortunately, despite the fact that most of the killings have proven to be unjustified, not a single policeman has been indicted, much less convicted, for their crimes. It seems that our law enforcers are above the law. Dyed-in-the-wool conservative Republicans justify most of the killings by arguing that the killed were criminals. Granted, some of the people recently killed by the police — such as Michael Brown, shot by a policeman in Ferguson, Missouri, after he stole some goods from a convenience store, or Eric Gardner strangled by policemen in New York for illegally selling cigarettes on the street—were petty criminals, but the role of the police is to enforce the law, not taking the law in their hands, or rather violating the law, and becoming juries, judges and executioners. Actually, one of the main reasons why we have police is to prevent citizens from taking the law in their hands. Moreover, not complying with police orders you think are illegal, abusive or outright unconstitutional should not carry a death sentence. Evidence shows that, contrary to police reports, most of the people killed did not resist arrest, much less put in danger the life of the policemen who eventually killed them. It is very difficult to believe that a person armed with a pocket knife, thirty feet away, can become a threat to a policeman carrying a military rifle with 30 rounds in the magazine. Most of the investigations after police killings ultimately focus on training, but this is not a problem of training, but of mindset. Far from servants of the public who pay their salaries, most policemen now see themselves as masters, with power of life and death over the serfs. To make it worse, the current militarization of police, evidenced in the way they dress, the guns they carry, the light tanks they are getting and, more important, their attitude, have transformed them into a veritable occupation force operating on a defeated country. But, contrary to peace officers, whose role is to keep the peace among citizens, the role of soldiers is to kill, maim and destroy the enemy. Obviously, the new police see us as the enemy and are treating us accordingly, and I have the feeling that this change in attitude is not the product of a mistake but of a carefully planned design. We cannot continue to rely on our military in order to achieve the national security objectives that we've set. We’ve got to have a civilian national security force that’s just as powerful, just as strong, just as well-funded. In other words, what the CFR puppet was talking about was the creation of an American Gestapo. Are the new militarized police the Gestapo-like national security force the CFR conspirators had in mind? Everything indicates that it is. Apparently conservative Republicans don’t see, or don’t want to see, that the police they love so much have become a tool of oppression in the hands of the globalist conspirators who hate America. They don’t see, or don’t want to see, that the America they claim to love so much has turned into a militarized police state. Nevertheless, people of other political persuasions apart from the two-party, Republican VS Democrat charade, are extremely concerned about the current role of the police in America. Some of them have advocated disarming the police or the outright elimination of police departments — a feeling I share to some extent. The current police force is acting like an occupation army in a country defeated in war. Currently, they treat us as the losers they must keep in line to avoid a rebellion. But, contrary to what these goons seem to believe, Americans didn’t lose any war against any invaders. If the ultimate goal of the police goons is to terrorize the American people, what they are actually doing is galvanizing the will of Americans to fight back. One of these days the police hoodlums are going to realize that they have been sitting on top of a powder keg, and the explosion they will provoke will be heard all around the world. 3. Rachel Aviv, “Your Son is Deceased,” The New Yorker, February 2, 2015. 13. I am convinced that most police departments are overstaffed and overpaid and also that they create problems to justify their existence. A few months ago I saw how a family disturbance, which would have been easily solved by two policemen, required ten squad cars, close to two-dozen policemen, equipped with dogs and assault shotguns, in an artificially created incident that occupied their time for more than four hours.